In this November 2018 blog, we reached out to drivers asking for their help in reducing collisions on I-5 near the State Route 16 interchange in Tacoma. Overwhelmingly, the more-than-200,000 drivers who use this area of I-5 daily do so safely. However, that doesn't minimize the frustration we all feel when collisions require crews to close a highway, especially when that closure affects a morning or afternoon commute. Yet again Wednesday morning in Tacoma, a collision involving a semi caused a full closure of I-5 while crews replaced damaged jersey barrier, removed two damaged semis, removed debris from the highway and cleaned a large fuel spill. We know drivers are frustrated that this keeps happening. We are too. The lane configuration on I-5 near SR 16 is a temporary one that has been in place since May 2018, and will be there through this April. It is allowing construction crews to build a new southbound I-5 alignment. Since the overnight hours of Sept.30/Oct. 1, seven collisions involving semis have occurred within the project limits of the I-5 – SR 16 HOV Realignment – HOV Structure and Connections project that resulted in closing both directions of I-5 for several hours. Back in November, contractor Skanska began implementing weekly work zone reviews of lane and edge line striping throughout the project. They doubled the number of reflective markers on the temporary barrier that is in place to increase visibility at night. At that time, we began displaying safety messages on the I-5 electronic reader board signs reminding drivers to slow down as they enter the work zone. We also conducted two separate reviews of the work zone traffic control that confirmed the traffic control set up and devices met state and federal standards. 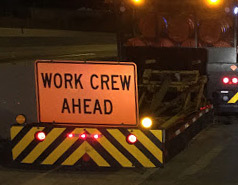 An advisory speed limit of 50 mph was implemented before entering the work zone on southbound I-5, reminding drivers that they are entering a work zone with narrow lanes and shoulders. Having a work zone with narrowed shoulders and lanes is common and is in place on most state highway construction projects. Those narrowed lanes and shoulders give construction crews room to do the work needed to maintain or improve the highway. Be kind to yourself and other drivers around you by paying extra attention to the road through this area. Speeding, following too closely or aggressive driving behavior is not advisable, especially during the dark, wet winter months. According to the Washington State Patrol, in almost all of these cases, the driver was cited for driving too fast for conditions, or negligent driving. Of course, I-5 in Tacoma is not the only place where we've seen recent collisions involving semis. For example, on Nov. 28, 2018, a semi collision closed I-5 south of Tumwater. On Dec. 12, two separate semi collisions closed I-5, first in Olympia and secondly in Lacey. And on Dec. 19, two semis collided on the northbound SR 7 ramp to northbound I-705 in Tacoma. Drive for conditions. When the pavement is wet and it's dark outside, slow down accordingly. Slow down through work zones. Many work zones have narrowed lanes and shoulders, which means less room for driver error. Remember we all share the highway. Semis in particular need more space to maneuver and longer distances to stop (two football fields, to be exact, when traveling at 65 mph). The website FleetNet provides great tips when driving near trucks, reminding drivers to maintain a safe distance, avoid driving in other drivers' blind spots (which can be surprisingly large areas on commercial vehicles), and avoid cutting off large trucks. We will continue to work with our contractor and the Washington State Patrol to do our part in helping drivers safely navigate through construction zones. Maybe semi's should have a slower than 50 mph speed limit thru the Tacoma/Hwy 16 construction area. Maybe they should be required to travel only in the right lane thru the area. Maybe all semi's should be required to take the collector/distributer lanes - that would remove them from the narrow lanes and reduce their speeds. Maybe install some temporary lighting. Most of the collisions seem to involve semi's - what can be done to slow them down and move them away from the rest of traffic. While I appreciate the things the contractor has done - it is obviously not enough. The State needs to step in and take some additional steps to improve safety and reduce these semi collisions. I AM frustrated that my commute is continuously disrupted because Semi's are having all these horrendous collisions. TLH, thank you for the feedback. We will share this with our traffic engineers and the contractor. We are working closely with the Washington State Patrol and are considering hiring extra law enforcement personnel to monitor the area to prevent speeding over the current speed limit. Seems clear by now that a 50 mph *advisory* limit is leaving traffic too fast for conditions. Why not a lower limit for the nonstandard lanes, and make it a mandatory construction zone limit, rather than an advisory one? It is everyone's responsibility to pay attention to the traffic flow and the speed. The comment that semi's are responsible for the accidents and should be made to travel only on the right lane and reduce speed to 50 mph is wrong. When the trucks are in the right lane they are constantly having to contend with vehicles entering and exiting the freeway. By being in the middle lane it gives them an option or an out if traffic makes a sudden change. I agree that things need to change for the better but it is not just the semi's causing the problem. I travel through there everyday and see people texting, eating breakfast, reading the newspaper or paperwork and messing around with computers or other things in the cars. They need to pay attention to what is going on around them at all times. What can be done to get the slow drivers out of the left lanes? If the left two lanes were used for passing cars and faster traffic, the wall of cars that form, where every car is going the same speed, more or less, in all four lanes wouldn’t form. Slower cars to the right, faster or passing cars to the left. Also,though the signage has gotten better at the hwy 16/I-5 construction area, I think more needs to be done. That split where 38th Street and I-5 move to left but 38th St ever so subtly stays right of the I-5 south traffic,’is treacherous. Even knowing it is coming up, I still get caiught off guard. Can you make larger/better signage?